Koalas and other endangered species are present across the northern suburbs and their survival depends on continuous tree cover but under this government planning has entirely failed to protect important bushland areas or limit the use of laws that allow the removal of trees. Whenever the choice is between development or bushland it is development that wins out every time. This must change. We know there are still koalas in Sydney’s north because they come into people’s front yards such as shown at Yanilla Ave, Wahroonga, above. Major infrastructure and housing proposals have removed or threaten thousands of trees. The Northern Sydney Freight Line – Epping to Pennant Hills Third Line removed 30,000 trees. Residential proposals including the Mirvac proposal at 55 Coonara Avenue, West Pennant Hills which threatens 28ha of biodiversity rich forest, and the proposed subdivision of 3 ha of ecologically significant forest at Byles Creek, Beecroft will result in the loss of hundreds of trees in a biodiversity rich core habitat. See detail below. The sheer amount of infrastructure and residential development occurring in North West Sydney accentuates the importance of preserving all ecologically rich areas from any further clearing. Equally however street trees and trees on private properties in our suburbs are fundamental to the movement and healthy breeding of vulnerable species. These trees link together the nature reserves, national parks and public forests to create the biodiversity rich corridors to allow animals to move across the landscape. This suburban cover is also under direct threat. Exempt and complying development legislation has directly contributed to the widespread removal of private vegetation to intensify private development. The continuing application of the 10/50 bushfire tree rules enable indiscriminate removal of large areas of vegetation as resident clear view lines or take the opportunity to clear their land. Council tree preservation orders are weak in the face of government legislation to facilitate individual development rights. Communities are unable to protect the trees that make their suburbs so precious and liveable. Cumulatively the resulting tree losses: fundamentally affect biodiversity and threaten the ongoing viability of populations of koalas, powerful owls and ringtail possums; reduce the potential to respond to and mitigate the impacts of climate change; and significantly reduce the amenity of neighbourhoods. It is literally death by a thousand cuts. “Despite the importance of the urban forest, it is threatened by unbalanced planning laws, weak council tree-preservation orders and the sale or commercialisation of local parks and public land. These problems are exacerbated by destructive and poorly monitored bushfire clearing policies, the loss of private garden trees to dense development, and new biodiversity laws that allow developers to pay cash for clearing bushland as a so-called offset”. “Our unique urban biodiversity is an important part of what makes Sydney so special, and unless we take action it will be lost. “Whether it’s powerful owl chicks on their first hunt in Byles Creek, or koalas spotted in a backyards, this contact with nature is so precious and worth protecting. “Strong laws that maintain foliage protections are absolutely key. NSW needs to urgently put in place laws that close loopholes that allow tree clearing. We also need to set tree canopy targets that are enforceable and responsive to local conditions. ” Mr Shoebridge said. Case Study – Coonara Avenue, West Pennant Hills, koalas and ringtail possums. 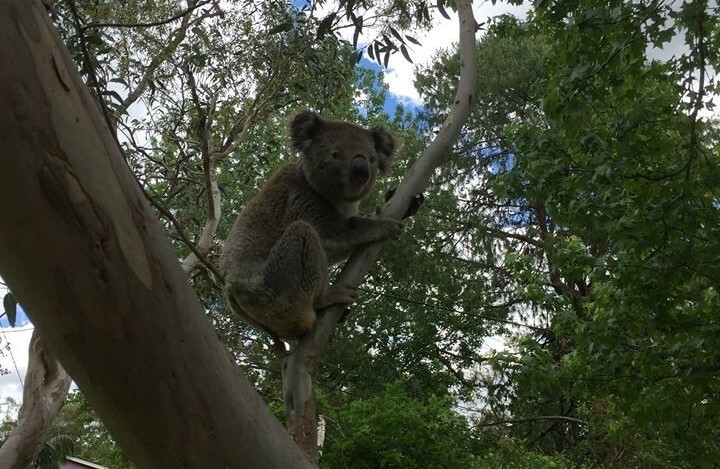 Property developer Mirvac, is pushing to bulldoze critical piece of koala habitat in a 28-hectare forest in West Pennant Hills, right next to Cumberland State Forest and just down the road from the koala park. This precious piece of urban bushland supports the survival and integrity of the last population of koalas in all of northern Sydney. It cannot be lost. The report states that Cumberland State Forest, together with the adjoining Mirvac site and Bidjigal Reserve, form a forested stepping stone within the fragmented fauna and flora corridor between Lake Parramatta Reserve and Berowra Valley Regional Park, and serve as an important corridor from Lane Cove National Park as well. This island of vegetation acts as a corridor for avifauna migration and breeding. The report makes clear that a number of threatened species, as identified under the Threatened Species Conservation Act 1995, including koalas, powerful owls and other vulnerable bats and birds occur across the wider forest. But this government is offering no protection to the forest. It is time the government intervened and declared the forest to be a nature reserve and brought it into the public estate. The future of koalas in northern Sydney is quite literally at stake. 3ha of ecologically significant forest which is home to the last known Sydney population of the Gang Gang Cockatoo and which is important powerful owl habitat. A Commission of Inquiry in 1988 found that the land was of significant local environmental importance and should be purchased by Council. Development Consent No. 94/2013 for the subdivision of land at the subject property was obtained on 27 May 2016 for a development that would see the removal of many trees. Most recently prosecutions were commenced for unauthorised clearing on the land with a guilty plea entered on 16 November 2018. A number of proposals currently threaten tree canopy at Manor Road. At present an interim heritage listing protects trees at 62 Manor Road, Hornsby. The DA for that property proposes removing 75 trees using 10/50 laws to allow them to ignore the local council tree protections. This kind of urban tree canopy connects reserves which means that green open spaces are not unconnected pockets, but are a viable habitat for animal and bird species. Recently a constituent identified the removal of a Blackbutt tree on the same street with a diameter of 1.6 metres indicating a tree that was over 100 years old (picture 3 below). This is emblematic of the kind of significant habitat trees being removed under the 10/50 bushfire clearing code.